If you like Art, Antiques, and cooking, come enjoy this gem in the woods right in the heart of the National Lakeshore. Grab a kayak or a canoe and take advantage of having the Lower Platte River practically in your backyard! 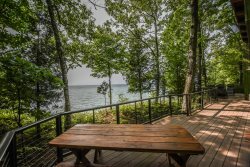 This cute cottage has all the amenities of the city but is perfect for those who love nature, bird watching, bicycling, art, canoeing, and the National Lakeshore. The back yard is comfy and private, just a short walk from the Lower Platte River and very close access to National Lakeshore trails and Lake Michigan beaches! This cottage, which is just under 1000 square feet but feels larger, is perfect for a small family or two couples. The team was very friendly! The cabin was updated and very clean. Overall a great stay!